HowTo: Install a B&M Shifter in a 2000-2005 Cavalier or Sunfire. This is based on the instructions provided by B&M and supplemented with my pictures and experiences. Carefully unclip the shift boot from the center console. I find it easiest to push slightly forward and up on the bracket from the back until the rear clips come loose. Then you can squeeze the sides to pop them loose and just lift it back and off. Undo the snaps to lift it over the shift knob. 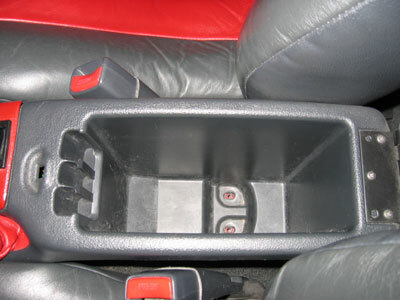 Remove the center console from the car. To do this, first pop off the small screw cap in the tray at the front using a small flat screwdriver. Then lift off the piece with the power window switches on it. It just pulls right off. You can then unclip the switch module from the trim piece and just place them down in the opening. If you don't have power windows, you will have a small tray where they switches would be. Just pull it up to remove it. Now there are 4 bolts to remove. These are all 9 mm. Two are in the compartment under the arm rest, one is under the cap you removed in the front tray, and one is under the part you removed from the middle. With those 4 bolts removed, you can now lift the console up and off. 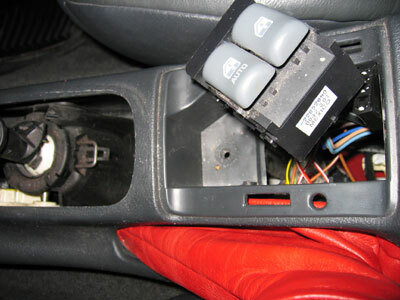 Ensure the e-brake handle is pulled up and start lifting the console from the back. 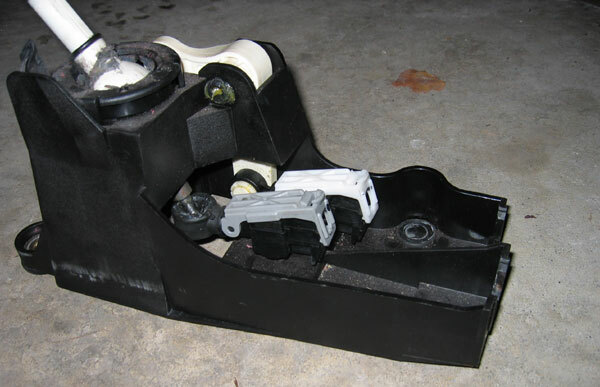 Work the e-brake boot up over the handle as you lift the whole console over it. Use a permanent marker to mark both cables at the point where they connect with the cable ends. This will allow you to reconnect them in the same position later. Disconnect the fore-aft and side-to-side shift cables from the shifter base by pulling up on them. Then disconnect the cables from the cable ends by carefully popping up the tabs on the ends of the connectors and lifting them up. This image shows how little they have to pop up in order to release the cable. Do not try to force them any higher or they may break. Be very gentle with these. If you break these, you'll need to replace them with new ones. 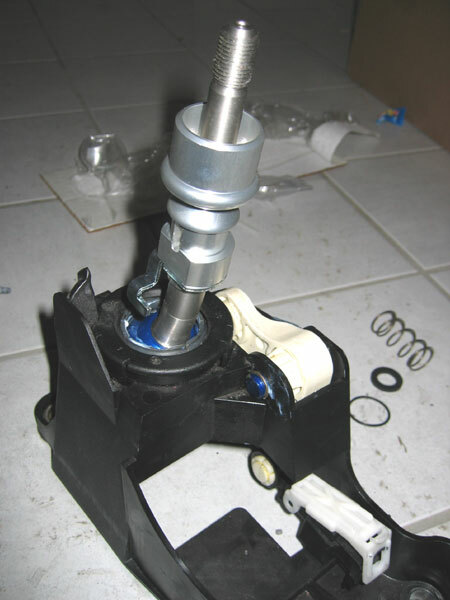 Using a 13mm socket, extension and drive, remove the mounting nuts and lift the shifter assembly out of the car. HowTo: Change Your 00-04 Manual Shift Knob. 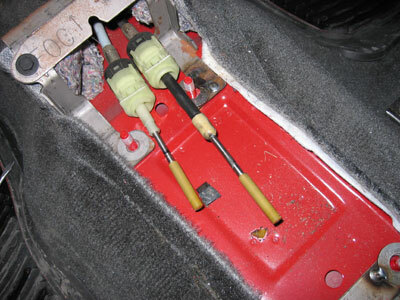 Remove the fore-aft cable end from the bottom of the shift stick. This just pops right off, though you may have to tug on it a bit. 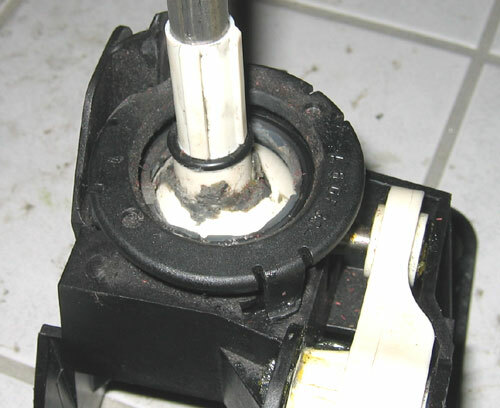 Remove the side-to-side pivot pin by pushing in the slotted end through the base. Don't worry about breaking it since it's replaced by the aluminum piece included in the kit. Just crack off the tabs and push it through the shifter base. 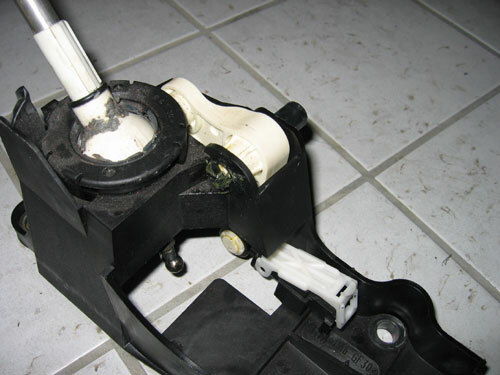 From underneath the shifter assembly, using a long thin flat blade screwdriver, carefully pry the three tabs of the plastic shift stick retainer toward the center of the base while pulling the retainer to disengage it from the base. Note: be very careful not to apply too much force since the plastic parts of the shifter are easily damaged and can break. Note the shape of the slots that the retainer is clipped into. Make sure it it turned so the clips are positioned in the wider areas to remove it. Remove the upper o-ring and then pull the shift stick out of the base. Note that there is also a lower o-ring. Save both these o-rings as they will be re-installed. Carefully disconnect the plastic main pivot housing from the shifter. Grease the main pivot of the B&M Short Throw Shifter and snap on the plastic main pivot housing. 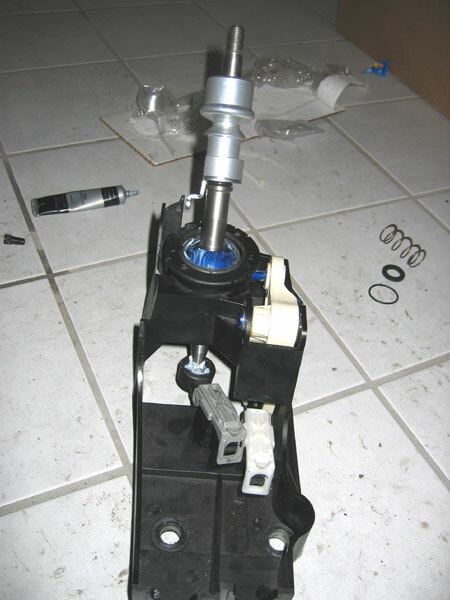 Place the lower o-ring into the shift base and then insert the B&M Short Throw Shifter, followed by the upper o-ring. 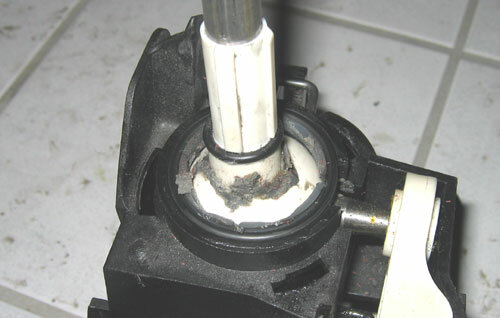 Make sure that the nylon pivot cup engages into the side-to-side actuating arm. Secure the shifter into the housing by snapping in the plastic shift stick retainer. Grease the supplied pivot pin and push it into the shifter base and secure it with the supplied c-clip. Grease the lower ball of the shift stick and snap on the fore-aft cable end. 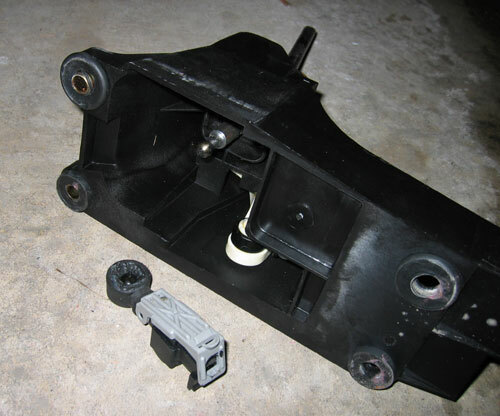 Reinstall the shifter assembly into the car and secure with the original mounting nuts. Re-assemble the cables back into the shifter base and onto the cable ends using the markings you made earlier as a guide. Temporarily install the shift knob and test entry into all gears with the clutch pedal depressed. Apply a dab of grease to the plastic interference "step" that blocks entry into reverse. Make sure each gear can be smoothly and fully engaged before proceeding. It may be necessary to re-adjust the cables. Remove knob. Replace the center console in the reverse order it was removed. Re-install the shift boot by hooking in the front clip and then snapping down the rest. Close the snaps over the appropriate spot on the reverse lock-out sleeve. 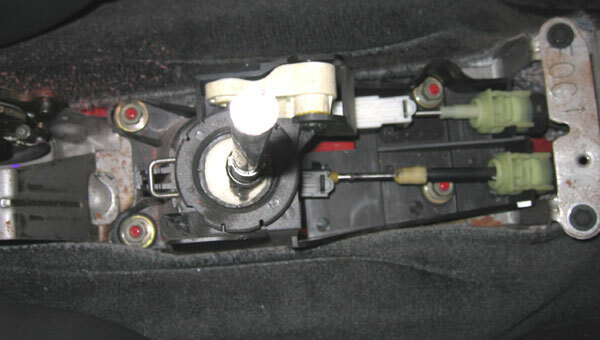 Install the rubber washer over the threads of the shift stick and into the reverse lock-out sleeve. 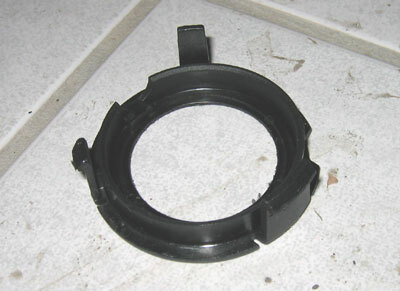 Then place the supplied spring on top of the washer. Screw the knob onto the exposed threads. Then install the supplied o-ring onto the knob insert and press the insert into the top of the shift knob, ensuring the B&M logo is properly positioned. Once again test the movement of the shifter into all gears ensuring there is no binding, rough or awkward movement. Do not operate the vehicle until each gear can be smoothly and fully engaged.